The Art Moves International Festival of Art on Billboards 2018 is over! This year, the theme of the Art Moves Festival was “Who governs our lives: we ourselves, other people or algorithms?”. We invited internationally renowned artists, young authors, and international audience to a common reflection on what really matters and gives meaning to our life. 562 artists from 76 countries entered the competition, we received 1024 artworks from Ukraine, USA, China, Taiwan, Philippines, Russia, Cuba, Great Britain, Iran and many others! 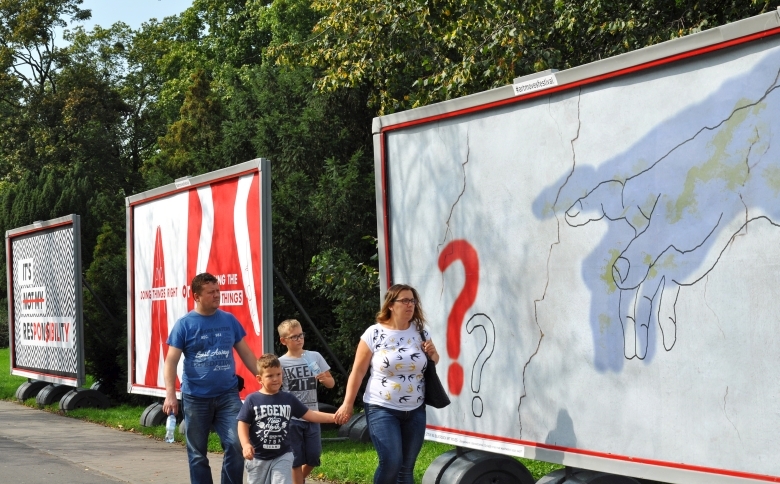 The international jury selected 10 most interesting projects which were exhibited on billboards located on Pl. Rapackiego in Toruń. The jury decided to confer the main award to Ying-Hsiu Chen and Hsiang-Ying Chen from Taiwan. The works of renowned artists participating in the festival were presented on city lights and LED displays located in different parts of Toruń. We would like to thank all the artists who took part in the festival, the participants in the competition, and all those who contributed to the organisation of this year’s edition of the festival. We would like to express our gratitude for support: Toruń Municipality and the Local Authorities of Kujawsko-Pomorskie Region, our partners: AMS SA and MZK w Toruniu, and media sponsorship: TV Toruń, TVP 3 Bydgoszcz, Radio Gra, Arteon, marketingprzykawie.pl, kampaniespołeczne.pl, SpodKopca.pl, Signs.pl, Dzień Dobry Toruń. We would also like to thank our wonderful audience for their active participation in the festival. We hope to see you again next year!